Over the last 14 years I’ve spent a fair amount of time following my co-worker, Matt Heiman, around in the woods. Trying to keep up with him, as he leaps across streams, inches down steep slopes or bush whacks through a dense thicket can be a challenge. But I’m always grateful to escape my computer and get out onto the land. Furthermore, tapping in to Matt’s knowledge of the natural world is, without fail, rejuvenating and inspiring. He inevitably answers the “why” of our work. That we never get lost is also appreciated. As someone who is easily turned around, I have always been in awe of Matt and other staffers’ ability to disappear into the woods and find their way back out again–a skillset I’m quite sure I will never develop. f our DeYoung Natural Area, and fronts Cherrybend and Strang Roads. At the time Matt and our Land Protection Committee were trying to decide whether this parcel should be kept and added to DeYoung, or sold with restrictions to a conservation buyer (in order to buffer our existing natural area). In the end, Matt made the case for keeping the land and opening it up to the public. 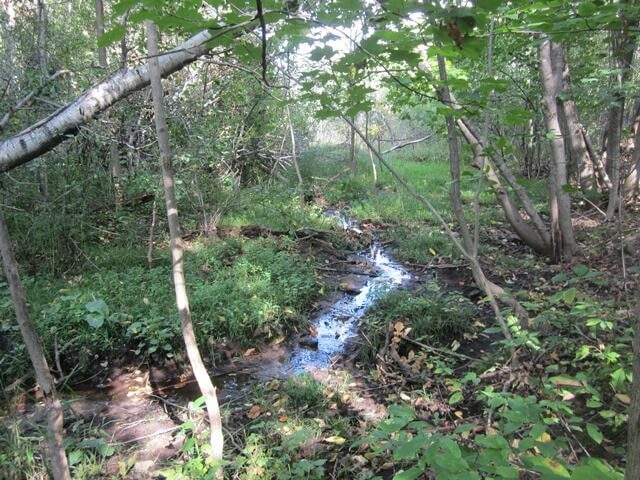 “Multiple streams and seeps emerge from or pass by the property on their way to Cedar Lake,” says Matt. 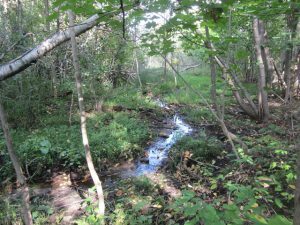 “Preserving this land ultimately protects the water quality of the lake as well as West Grand Traverse Bay.” A rare marl spring is also present the land. The broad variety of habitat is unusual and hosts an array of wildlife. 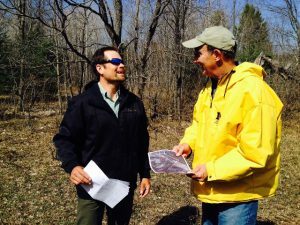 “You have a diverse young forest, an old agricultural area that has been naturalized, you have thickets and fields and streams, all within 48 acres,” says Matt. “As a result, there are upland game birds like grouse and wetland mammals such as otters and mink that go up and down the creeks.” The property is part of a wildlife corridor that encompasses Cedar Lake, DeYoung, and private protected lands that eventually connect to the Pere Marquette State Forest. Vegetation along the streams is biologically diverse, and hosts songbirds, amphibians and insects. Black cherry, native red osier dogwood and white pine are plentiful. Finally, adding these 48 acres to the 145-acre DeYoung Natural Area just makes that place even better for humans and wildlife alike. Located on the outskirts of Traverse City in an area full of rapidly developing dense subdivisions, DeYoung has often been called an oasis and a gateway to Leelanau County’s agricultural heritage. Great news! We’ve been hiking Leelanau Cty trails for year but did not realize there was an additional trail off Strang Rd until we got your published pamphlet of all the areas this Spring/Summer. Cary and I decided to check it out this fall and were pleasantly surprised at the trail and views. What a gem. Nice to see the area expanded. 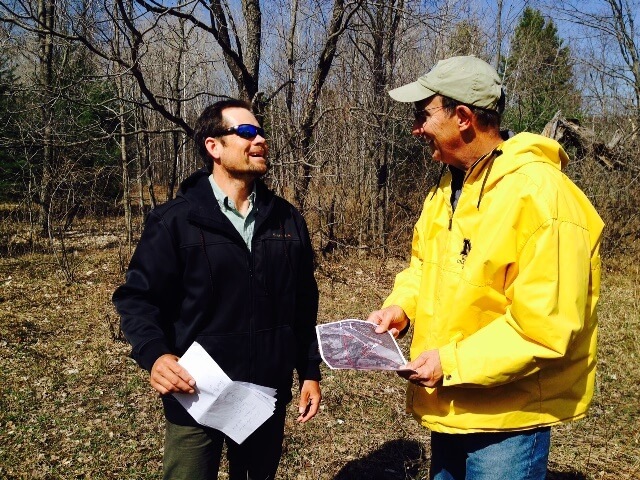 Jim–yes, you are talking about the upland trail. Well, within a year or two, we hope to have additional trails right across Strang Road about which you are speaking.